In this text I give my list of the 20 best backpacking packs for men that are available on the market in 2019, all top brands and the packs with great features for extended tours. Backpacks for extended outdoor trips with lots of attachment elements and pockets. Modified new versions of the already existing models. Models that have been around for some time already. Regarding the size, I include backpacks with the volume above 58 liters. All of them are with the full set of attachment elements and straps, so you can attach many items outside. In other words, they can carry far more than what you might conclude from their official capacity. Ultra-lightweight minimalist designs where everything is done to reduce the weight while still remaining functional. Lightweight backpacks where almost nothing is missing, but they are built to save the weight. Load-hauling packs where the focus is on heavy loads and therefore the suspension is strong and generously padded so that the load is carried comfortably. Exceptionally ventilated backpacks. Those can be both ultra-lightweight but also with huge padding on the hip belt for heavy loads. Below I give the packs with just a few details, for more detailed descriptions please follow the links to my full reviews. 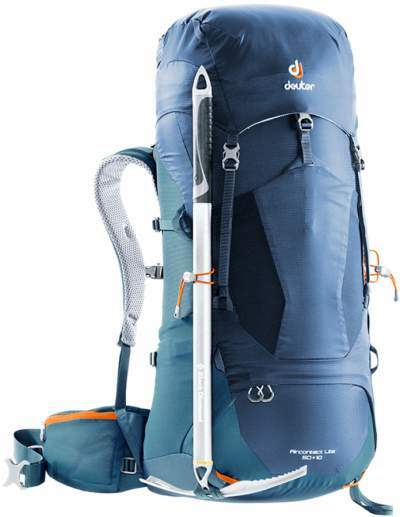 Deuter Aircontact Lite 65 + 10 Backpack For Men. This Airccontact Lite 65 is a part of a brand new series which Deuter launched in 2018. It is very similar to their existing ACT Lite series which they are likely going to discontinue. So the name already reveals a few details, this pack is with an expandable collar and this gives 10 extra liters of volume. To accommodate for such a collar, the lid is adjustable and also removable. Having such a feature is very useful on a long trail without support; you are supposed to carry lots of food in the beginning and you will need such a space. In time the load will reduce and therefore you can collapse the collar to its normal shape. But this pack has a lot more. The harness is with what they call the Vari-Quick adjustable system, so it is fully adjustable. The padding everywhere, including the hip belt, is enormous, so the pack is able to support lots of load. There is an aluminum X-shaped frame behind, to transfer the weight to the hip belt. You have a bottom compartment as the second entrance, and there is a real zippered divider between the two departments. The pack is with 7 pockets and with all possible attachment elements & straps, so lots of stuff you can carry attached to the pack. It is not here because of its exceptional weight, it weighs 4.387 lb (1990 g), so it is reasonably lightweight. The volume/weight ratio is VW = 38 L/kg and this is quite good as you will realize when compare with other packs here. New 2018 Deuter Futura Vario 50 + 10 pack. The Futura series by Deuter is the best they have ever built. If you are curious who invented the trampoline style tensioned mesh which you have here and in many other packs on the market, it was Deuter several decades ago, and they introduced it for the first time ever in their Futura series. Later, they added the adjustability to the system, so this is what the Deuter Futura Vario is about. If you need a backpack with the best possible ventilation, this is it. I have been using these packs in the past 15 years already. Now, the Futura Vario 50 + 10 has been around for many years, but in 2018 they have launched a new version of this pack. There is a lot of new stuff in the back system, but it is still an adjustable Vari Slide torso system and with a great ventilation. See what else this pack offers. You have 3 access points (top, bottom, front), and one feature which I particularly love to have is the zippered upper side pockets. The shoulder straps are with what they call the ActiveFit shoulder straps system, and you also have the Vari Flex hip belt system. Both imply a very flexible and mobile systems, so the pack moves with your body. The pack has 9 pockets, so it offers the best possible organization on the trail, and you also have the rain cover included. In the name you see +10, this implies an expandable collar for an extra load which you will need in the beginning of the tour when you have more food in the pack. You also have the full set of attachment loops and straps, so plenty of stuff can be carried attached to the pack. The weight is reasonable, 4.56 lb (2.07 kg), so it is not lightweight but see all its features, you will not find many packs to match what you have here. The volume/weight ratio is VW = 29 L/kg. Granite Gear Crown VC 60. With the Crown VC 60 pack, it is all about weight saving. So this is a very minimalist design and this results in its weight which is 0.96 kg (2 lb 2 oz) for the R size. So this is an ultra-lightweight option for ounce-counters. The volume/weight ratio is among the highest that you can find, VW = 62 L/kg. The pack has no metal frame, there is only an HDPE panel which is also removable. There is only the top entrance to the main compartment, and there is no bottom compartment. The harness is fixed, but the pack is built in two sizes, so you can choose your best fit. Also, the hip belt is built in 4 different sizes. The pack is without lid, you have an interesting roll-top closure instead. Regarding the pockets, you have them only stretch mesh type, 5 in total, and 2 of them are very small ones on the shoulder straps. But the pack has quite a number of tiny compression traps and also several tool loops, so you can attach some stuff to the pack. Please read more in my full review. If you would want to find the best backpack built by Gregory, then I am sure most of the backpackers would point out this pack. So this is a celebrated and award-winning series which includes several packs, both for men and for women (under the name Deva). These packs have been around for many years already, but they have been thoroughly redesigned and improved in 2018, and I blogged about this in my separate text. So, this is a load-hauling backpack and if this is the main thing you need in a pack, this is it. It is designed for heavy loads and you will carry it comfortably. This pack is also incredibly rich in features, so here are a few. You have 15 different combinations in sizes for the hip belt and harness, but note that strictly speaking the harness is not adjustable, you have only two positions for the length. That said, the pack is built in 3 different sizes so you will be able to find your best fit. Here you also have what they call the Auto Angle Adjust (A3) hip belt and shoulder harness, in other words, the system pivots and follows your body movement, this saves energy and reduces fatigue. The reservoir sleeve is cleverly designed so it is removable and it doubles as a detachable daypack. You also have a rain cover included. The pack is with 3 access points, from the top, from the front, and from the bottom. On the shoulder straps you have the QuickStow system for glasses, and if you want to be organized, this is the pack for you. It comes with a record number of pockets, 10 in total, plus all compressions straps and attachment points which you may need. The pack weighs 5 lb 1 oz (2.33 kg) so the volume/weight ratio is VW = 28 L/kg. The Optic series for men (and Octal for women) is the lightest series Gregory has built so far. But at the same time, these packs are not at all minimalist by the design. This a brand new series they launched in 2018. The Octal 58 is the largest in the series and it weighs 2.52 lb (1.14 kg), so the volume/weight ratio is enormous VW = 51 L/kg. Let me show what you do not have here first. There is no harness adjustability, and there is no bottom compartment. But the pack is built in three sizes so you can find your best fit. You have a proper metal frame behind the well-padded back panel, the shoulder straps are also well padded and the same holds for the excellent hip belt. The lid is removable and in this case, you can reduce the weight even further; note that you have an integrated flap jack to close the pack properly. The pack comes with a rain cover, and you have 7 pockets in total. It also has the QuickStow attachment for glasses. So as you realize, almost nothing crucial is missing here. Gregory Mountain Products Paragon 68 pack for men. The Paragon series for men (and Maven for women) was launched in 2017, and this might be their best series so far, with all essential features yet very lightweight. The Paragon 68 is the largest in the series and it weighs 1.64 kg (3 lb 10 oz), so the volume/weight ratio is enormous VW = 41 L/kg. But see what this pack offers. They build it in two sizes, yet you still have a fully adjustable harness. This is what they call the Aerolon suspension. But you also have a unique adjustability on the hip belt. The pack comes with an integrated rain cover. You have a top and bottom access to the pack, and the divider doubles as a top flap for a lidless use. So you can reduce the weight and still close the pack. But this is not all, the water bladder sleeve doubles as a SideKick daypack. The bottom straps are removable to reduce the weight when you do not need them, but they also double as a hip belt on the mentioned SideKick daypack. The pack is also with the QuickStow feature on the shoulder strap for attaching glasses on the go. So you realize, this pack has everything you might need on the trails. Please follow the links for more. New 2017 model Gregory Stout 65. The Stout series by Gregory has been around for a number of years already. But they have heavily modified it in 2017, and I blogged about it in my earlier text. The Stout 65 looks a bit like the Paragon 68 shown above, but it lacks some features. Note that they also have the corresponding Amber series for women. This is still a very lightweight series, great packs but perhaps a bit overshadowed by the Baltoro and Paragon packs. So the weight here is 1.73 kg (3 lb 13 oz) and the volume/weight ratio is VW = 38 L/kg. The pack is built in one size, but you have a fully adjustable harness. You also have an adjustable hip belt in the sense that you can reposition the hip fins to find the best position for your body size, this is the same what you have in the Paragon series. There is a bottom compartment with the usual divider, and the pack comes with the rain cover. There are 8 pockets in total. all the usual loops and straps are in the place. So you see this is a very complete yet very lightweight backpack. This Zulu 55 is one of those mentioned above that have been on the market for a number of years already, but it has been updated for the season 2019. So this is now a very different backpack with a completely adjustable shoulder harness and torso length. But this pack is also with excellent ventilation as you can realize from the picture above. This is a trampoline style mesh tensioned by the peripheral steel frame and with central stays and an HDPE panel. It has what they call the Free Float system which allows the hip belt to pivot and flex with the movements of your body. 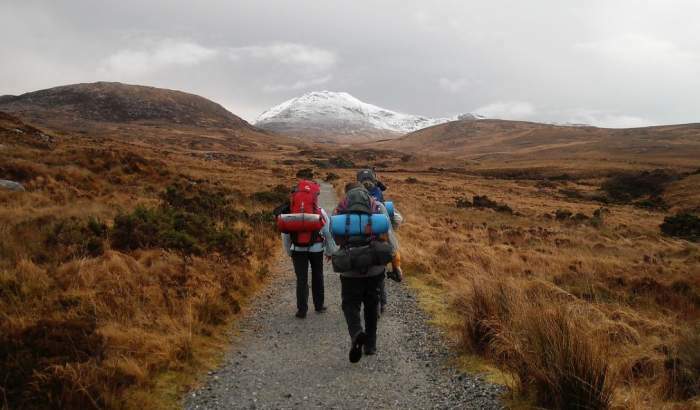 The pack comes with a rain cover included, a floating and adjustable lid, and three access points, from the top, from the front, and from the bottom. The volume/weight ratio is VW = 33 L/kg, and the weight is 3.66 lb (1.66 kg). 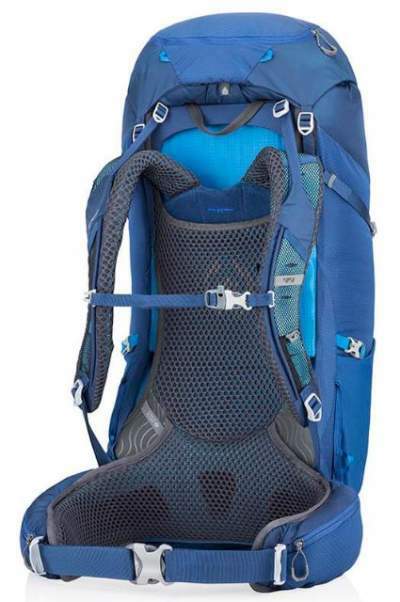 So this is a lightweight pack with all the features you need on the trail. 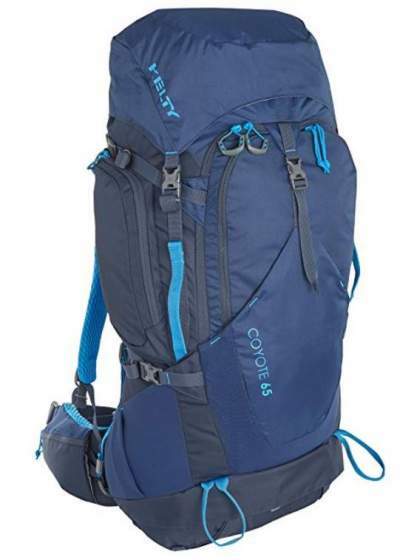 Kelty Coyote 65 backpack for men. There are two major reasons for having this Coyote 65 pack in the list. The first is its suspension system. Here you have what they call the PerfectFit, and it is as its name says. The meaning is that you can adjust your harness length with the pack on the back, there is no need to stop and take it down, all can be done on the go. So more perfect it cannot be. On the other hand, the padding is exceptionally pleasant and generous. Therefore, the pack is built to carry heavy loads and to carry them comfortably. The second reason is the number of pockets. You have 10 pockets plus 2 pass-through pockets. You will not find a pack that can match this. This is a rare example where you also have the side zippered pockets. You also have 3 access points, through the top, from the front, and from the bottom. So you have a removable lid which doubles as a day pack, and you also have the bottom compartment. Note that the pack is without rain cover. The weight is 4 lb 13 oz (2.2 kg), so it is not lightweight, but you have very strong fabric here, plus so many pockets, metal frame, and many attachment elements. The volume/weight ratio is VW = 30 L/kg. Note that you also have a bigger version from the same series, the Kelty Coyote 80. They have built the corresponding versions for women, the Coyote 60 and Coyote 70. Please read more in my full review. Kelty Red Cloud 110 Backpack. If you go for an extended and unsupported trip in a cooler environment and carry lots of bulky stuff, you might need such a big backpack. The Red Cloud 110 is the biggest here in the list and it weighs 5 lbs 8 oz (2.5 kg). So the volume/weight ratio is excellent VW = 44 L/kg. 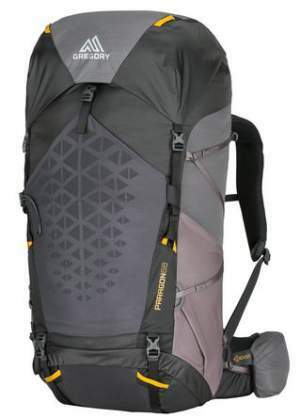 But if you feel the pack is too big, no worry, they have also a 90-liters version with the same features. You have 3 access points here, from the top, from the front, and from the bottom. The pack is with an internal frame and the padding is excellent. The torso size is fully adjustable and this in the best way, you have here Kelty’s PerfectFit suspension, two straps on the sides so you can easily fine-tune your best fit even with the pack on your back. The lid is removable and it can be used as a day sling. If you need many pockets for organization, this is the pack for you, it has 10 pockets plus 2 pass-through pockets on the sides. Note that it comes with side zippered pockets as well. This Apex 60 pack is built in the best style of the Mountainsmith brand, and this implies an incredibly durable Cordura fabric and a great load capacity. 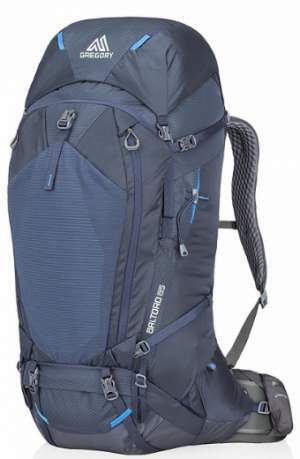 With this pack, you should be able to carry the load of up to up to 60 pounds (27 kg). Note that this is the smallest pack in the Apex series, you also have the two giants the Apex 80 and Apex 100 packs. The pack weighs 4 lb 15 oz (2.2 kg), so it is heavy, the volume/weight ratio is VW = 27 L/kg, one of the smallest here. The pack is with an adjustable torso length, and you also have a peculiar feature here – two different positions for the load lifters, so this you can use depending on the load above your shoulder line. Yet another great feature is the TuningFork frame sheet in the waist belt. This is combined with a very generous padding which makes an ideal hugging of the waist zone. This all is supported by an aluminum X-shaped frame, so it is not surprising that it can carry such heavy loads. You have the classic top entrance but in addition, the pack has a large front zippered entrance as well. Note however that there is no separate bottom compartment but it is not needed because of the large front opening. There are 6 pockets in total, and you have the usual side compression straps, plus dual daisy chains on the front, and also compression straps on the bottom. 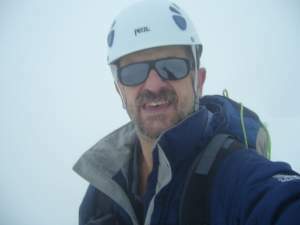 Dual loops for ice axe and trekking poles are visible in the picture, and those are paired with bungee tie-offs. But there is no rain cover here. Note also that this is a really affordable backpack. This pack has been on the market already, but in 2018 they have thoroughly reshaped it. Note that they have also added the Scream 50 pack into the series as a completely new pack with a women-specific design. The pack now has a central aluminum stay in the suspension. It also has a new front access and you have the top access as well which is a roll type. There is no bottom compartment and the harness length is fixed. So this is a rather minimalist design and you see this in its weight which is only 2 lb 13 oz (1.28 kg). So here you have the volume/weight ratio VW = 43 L/kg. The pack is with 6 pockets in total, and you have plenty of the attachment elements, including one daisy chain as well. This compensates for its relatively small volume. It is certainly worth mentioning that this is the most affordable backpack here in the list. So if you are on a budget, bear this in mind. 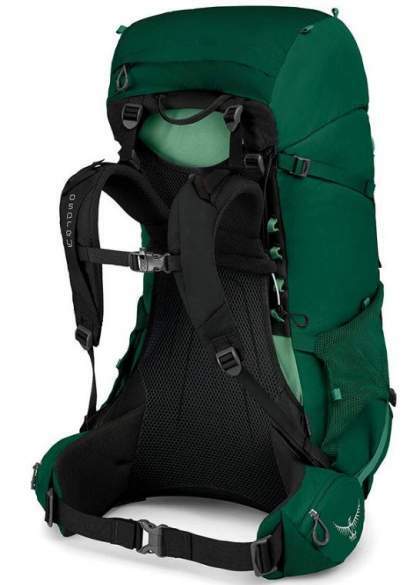 But this pack is designed to carry a heavy load of up to 45 lb (20 kg). Mystery Ranch Stein 62 Pack. This Stein 62 pack is a load-hauling tool, designed to carry loads of up to 75 lb (34 kg). Apart from this, I would say that its best feature is a unique lead which doubles as a daypack. Note that to use this lid as a day pack, you actually detach the harness from the main pack and use it as a harness for this small pack, and this daypack is truly functional and technical pack. I do not remember seeing anything like this on the market. Yet another peculiar feature here is that the frame is not metal but a carbon fiber. The harness length is fully adjustable and the padding is huge and comfortable. The pack is built in 4 different sizes, so finding your perfect size and fit should not be an issue. There are three access points, top, side, and bottom. Now, the bottom access is again something unique, you have a roll closure. The pack is with 6 pockets, but there are no compression straps on the bottom. Note also that you do not have hip belt pockets and it comes without rain cover. The pack is in the group of heavy tools with its 4.7 lb (2.13 kg), and the volume/weight ratio is VW = 29 L/kg. Please read more in my full review. 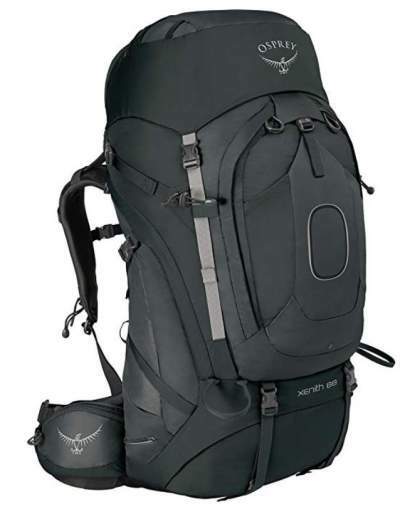 Osprey Aether AG 60 Pack. The Aether series by Osprey has been around for many years and this is one of the best they have ever built. But in 2017 they have added the so-called anti-gravity (AG) design as I blogged about it in my earlier text. With this, they have built a nearly perfect backpack. This Aether AG 60 is one in the series, just to know if you need something in a different size. You also have Aether AG 70 and Aether AG 85. Note that they have the corresponding women-specific series under the name Ariel, so see this Ariel AG 65 and Ariel AG 55. The Aether AG 60 is with an adjustable harness and it also features a moldable hip belt. This means that the foam used in the construction under your body heat becomes molded to fit perfectly your figure and it then remains in that shape. Both the hip belt and the harness are also interchangeable, so you will always be able to find your best fit. In addition to this, you have 3 different sizes of the pack within this 60-liters size. Namely, you can choose any of the 57, 60, and 63 liters size. You have a floating lid and the top entrance, plus the side entrance and the bottom compartment with a removable divider. Yet another nice feature is that the pack has attachment option for the Osprey Daylite pack. It comes with shoulder straps with mesh and edgeless wrap. You have a dual access to its main compartment. You also have an adjustable chest strap. It has a zippered pocket. You would not believe, but it has an external hydration sleeve with a hanger for the water bladder. There is a tuckaway attachment loop on the bottom, and it is paired with a bungee cord on the top, to attach an ice axe. You also have 4 attachment webbing loops. So can you imagine so many features only on the daypack which doubles as a lid? But now back to the main pack, it weighs 2.34 kg (5.15 lb) so it is heavy and the volume/weight ratio is VW = 26 L/kg. Please read more in my full review. 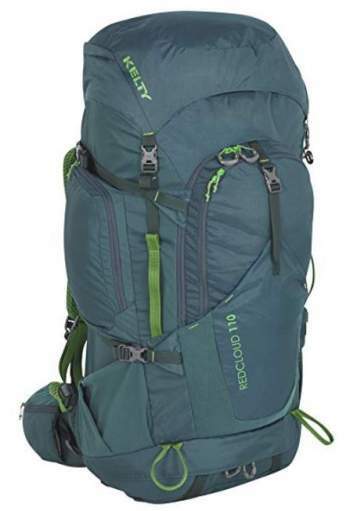 Osprey Atmos AG 65 Pack. The Atmos is a celebrated and award-winning series by Osprey (together with the corresponding Aura series for women). This is also an AG series and it has been so in the past, but in 2018 they have modified it slightly. You can read about this in my recent text. The Atmos AG 65 is the larger of the two, you also have the Atmos AG 50. Thd corresponding packs for women are the Aura AG 50 and Aura AG 65. So let’s see what you have here. The Atmos AG 65 is a bit lighter than the Aether pack above. It weighs 4 lb 9 oz (2.07 kg) for the medium size. So the volume/weight ratio is VW = 31 L/kg. They build it in three sizes so you have 62, 65, and 68 liters. On the other hand, the harness is fully adjustable, and you also have a fit on the fly hip belt feature. This is based on a Velcro connection so you can move the fin forward and backward for the best fit. The pack comes with an integrated Flap Jacket, so you can remove the lid to reduce the weight and you can still close the pack nicely. The pack comes with 9 pockets, and you have all the usual compression straps, plus the Stow-on-the-go trekking pole attachment system. In general, this is one of the best backpacks on the market and if ventilation is important for you, this is the pack to consider. This Rook 65 is from a completely new series from Osprey and the reasons for adding it to the list here are the following. 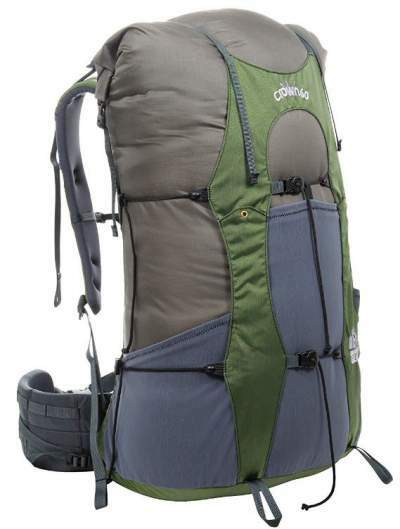 This is a lightweight pack that weighs only 3.53 lb (1.6 kg) and the volume/weight ratio is around 41 liters/kg. If it is too big, they have a smaller Rook 50 pack as well. On the other hand, it comes with an excellent ventilated back panel which includes a tensioned mesh and an adjustable torso size with a unique ladder-type adjustability system. You also have a rain cover included, the pack comes with a fully padded hip belt equipped with zippered hip belt pockets. 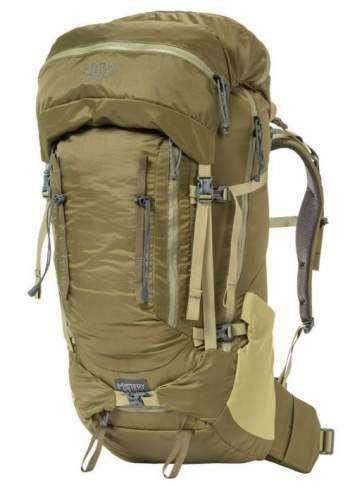 Above all, this is a very affordable pack, at least for Osprey standards, and it also comes with Osprey All Mighty guarantee. 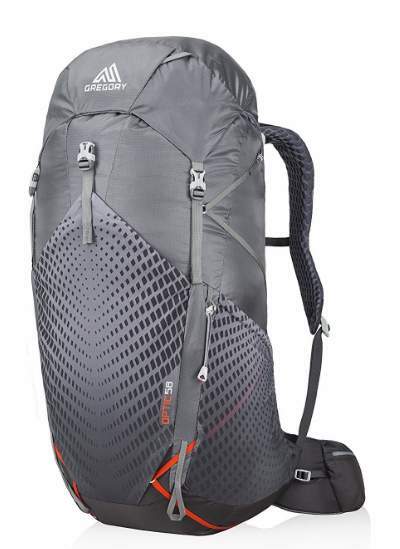 The Xenith 88 is in the middle of the Xenith series which includes also a pack of 75 and 105 liters. They have the corresponding Xena series for women as well. My feeling is that it is not as popular as the packs from the Aether series, but I am convinced that it better suited for the largest loads. The pack is built in three different sizes within the nominal 88 liters size, so you have 88, 92, and 96 liters. As you see the differences are substantial. The harness is adjustable and it is also interchangeable and this holds for the hip belt as well. You also have a heat-moldable foam used in the construction so the pack adjusts itself to your body shape after some break-in time. You have the top access, plus 2 sides openings, plus the bottom compartment access where you have a removable divider. The pack comes with 9 pockets and all attachment elements that you may expect from such a huge pack, plus the Stow-on-the-go trekking pole attachment system. The weight of the 88 liters version is 2.38 kg so you have a very high volume/weight ratio is VW = 37 L/kg. Please follow the link for more. 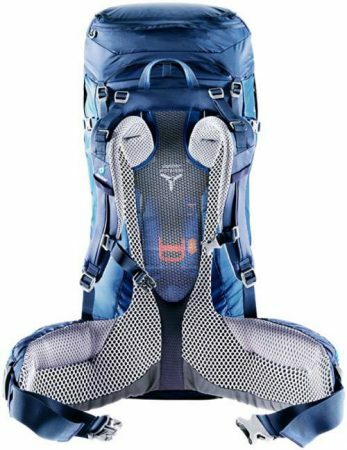 Teton Sports Grand 5500 Pack. The Teton Sports brand may not be as popular and famous as some of the brands above, but this brand is well-known for their affordable equipment items. Now, this Grand 5500 is a part of their black series, and I am convinced this is the best they have built so far. So what you have here is a truly great value/price combination. The pack is incredibly rich in features. So this is a 90-liter backpack with lots of volume and with lots of options to attach the stuff from outside. There are 4 access points here, top, front, side, and bottom. There is an expandable collar under the floating lid, and you have a huge U-shaped front entrance. The divider between the bottom compartment and the main compartment is with a zipper and it is removable. The material is very durable 420D and it has 1000 mm waterproofness rating, and you have an adjustable harness supported by two aluminum stays. The hip belt is with a great padding and one of the best designs. Note that the pack comes with a poncho included instead of the usual rain cover, with 2000 mm rating. The weight without the poncho is 5.2 lb (2.36 kg) so the volume/weight ratio is VW = 38 L/kg. This pack has more attachment elements than any other in the list, with two unique holsters, one under the lid and one on the bottom. It comes with 7 pockets as well. Note that the large front pocket is, in fact, detachable and it doubles as a daypack. So now you realize why I included it here in the list. 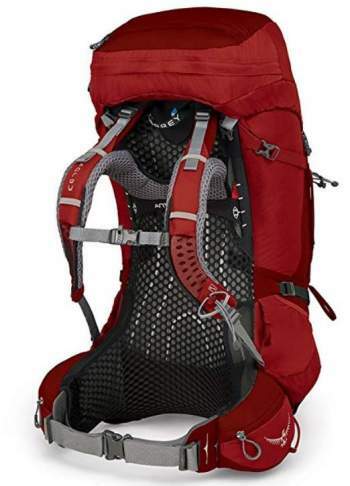 If you feel this pack is too big for you, note that they also have Mountain Adventurer 4000 Backpack which is 66 liters and nearly the same features, the same black series. The North Face Terra 65 Exploration pack. 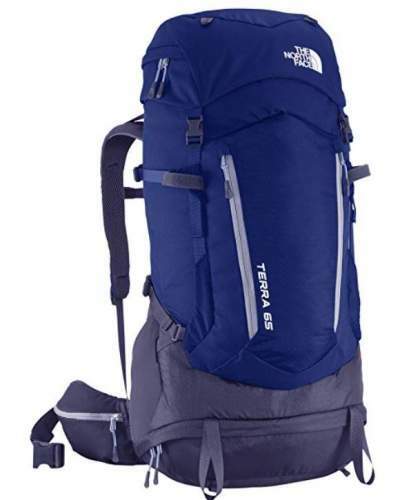 The Terra 65 pack has been on the market for a number of years already. It is built in two sizes, 64 and 66 liters so the nominal 65 liters in the name is just the middle value. The smaller 64 liters pack is 4 lb 5.8 oz (1980 g), and this is reasonably lightweight. The volume/weight ratio is VW = 32 L/kg. The pack is with a classic top lid and the top access, but you also have a front zippered entrance, plus the entrance through the bottom compartment. You have an easy to use system for the adjustable harness and the padding is very generous and with integrated ventilation channels. There are 8 pockets in total, but note that you do not have a rain cover here and also the pack is without the bottom compression straps. 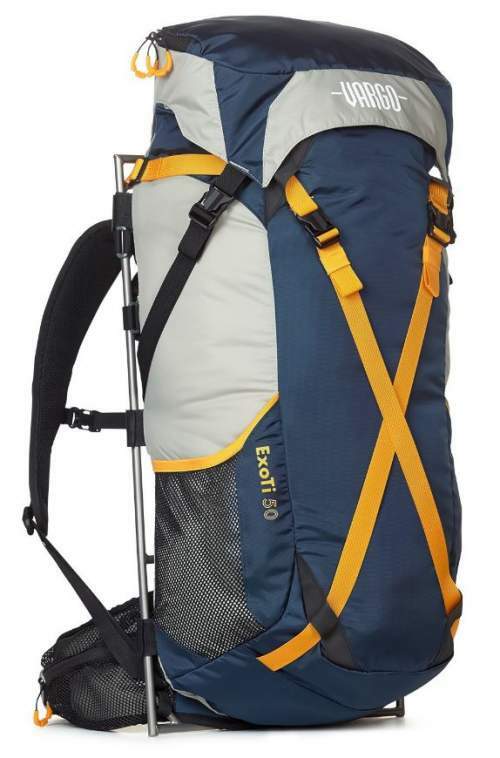 You would not expect to see a pack with an external frame here in the list, but this Vargo ExoTi 50 is indeed one of them and you have a titanium external frame which is so low profile that it looks like an internal frame backpack. 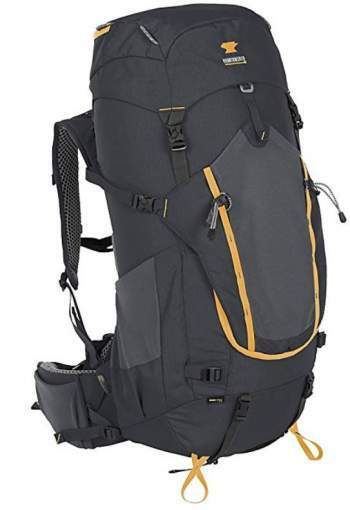 The reason for having this pack in the list is its weight, this is an ultra-lightweight backpack that weighs only 2 lb 11 oz (1.21 kg) which means that you have the volume/weight ratio VW = 41 L/kg. You realize this is one of the best numbers here. The pack is a top-loading type with a removable lid, and you do not have a bottom compartment here. The frame is incredibly strong and rectangular and the torso length is adjustable, you have a sliding system behind the frame. One of its important features is the massive lumbar padding so this together with such a frame is something you need for heavy loads. Note that the pack is without a rain cover. 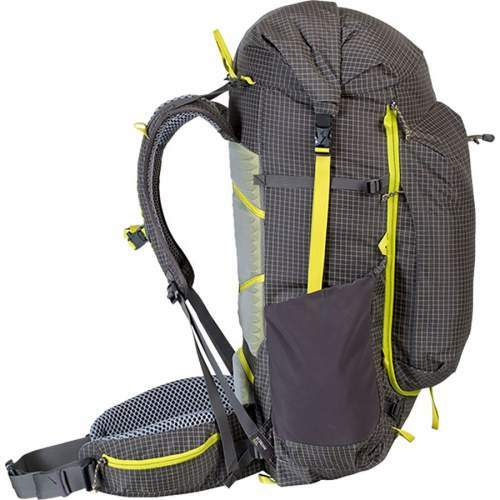 The pack has 5 pockets in total and there are several attachment elements and compression straps, but you also have the frame around so attaching anything with some extra cords is easy. Please follow the link to see more. If you need a pack with a great ventilation, then certainly your choice should be the Deuter Futura Vario 50 + 10, Gregory Zulu 55, and also Osprey’s Rook, Aether, and Atmos packs. The tensioned mesh system they have is without match regarding the ventilation. If this is about the weight, then check the weight in the absolute sense and also the VW ratio. I guess it is obvious what to choose in this case, the Granite Gear Crown is the absolute champion. The Gregory Optic 58 is not far behind it, and it has more features. 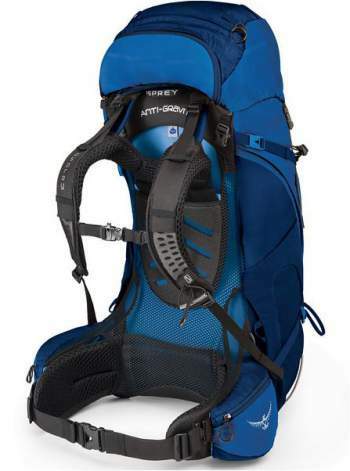 But the pack richest with features and at the same time very lightweight is the Gregory Paragon. If this is about the load hauling capabilities, certainly consider the Vargo ExoTi 50, Gregory Baltoro and Kelty’s packs, as well as the Mystery Ranch Stein pack and the Xenith pack. If you are on a budget, check the Mountainsmith packs, and also the Teton Sports Grand and Kelty’s packs. My favorite? This is Deuter Futura Vario due to two main reasons, the tensioned mesh system plus great pockets. There is one more, I have been using Futura for 15 years already. But my priorities are not necessarily yours, so choose wisely only what suits you. As you realize, there is no pack that appears twice in the top choice for any of the categories, and in the 2nd and 3rd best groups, only a few times the same pack appears in two categories. You remember what I said above, no pack is the best pack for every aspect. This is my temporary list with the best backpacking packs for men that are currently on the market, and as the new models appear I shall modify it. So bookmark this page and visit it from time to time. As you realize, many of these packs have corresponding packs for women, and I have mentioned many of them. But if you need a list of such packs with the women-specific design, please read my text with the best backpacking packs for women. Thank you for reading. Is there something you feel I missed here? It must be, everybody’s taste and priorities are different. So let me know, I shall consider what you suggest, there is a comment box below. Note that there are many more great packs in my pages with packs above 56 liters, and in the page with packs below 55 liters. So you realize that the list presented here is very short as compared with what you have in the site.